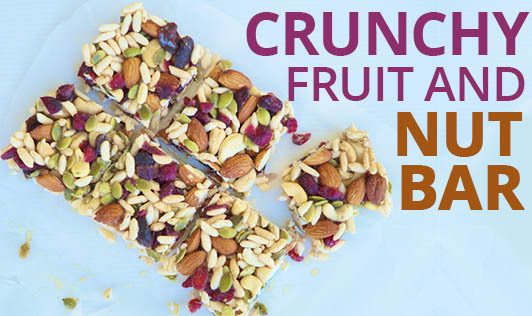 Crunchy Fruit and Nut Bar! This sweet treat is healthier than a candy bar or a chocolate bar. You can count it as a sweet treat for the day. It is also a nutritious snack for your kid, so bribe them liberally! • Combine all ingredients together and mix well. • Spread half an inch thickness of this mixture on the butter paper and bake it at 300 degree Fahrenheit for 20 minutes.